So the autumn items are arriving the shops, and Costa have a new range of drinks for the season referred to as the Bonfire Spice family. I’m trying out the Bonfire Spice Latte to start and am sitting with a warm cardigan on and a pair of sheep’s wool boots. It doesn’t seem too long ago I was moaning about it being too hot and buying a fan. Oh well, hopefully this drink will help me warm up to the colder weather. Now the first thing I thought was weird about this drink was that I ordered a Medio (Medium sized drink for those that don’t speak Costa) and was told that the new drinks are only available in Primo (aka Small). 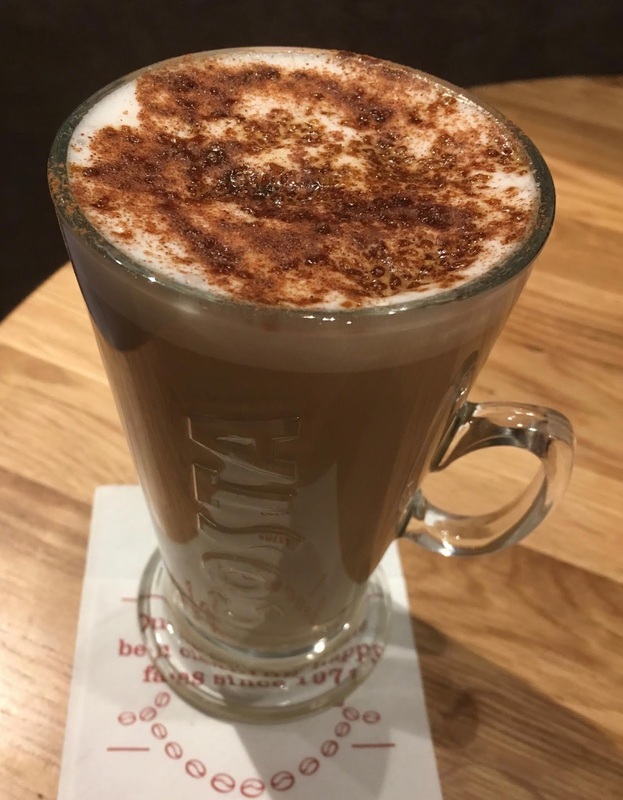 I’ve googled a bit to find out why and didn’t hit any results, so my assumption is going to be calories, hot drinks like these are often in the press for their loaded calories that people forget to count as they are “just a drink”. Weird though as they are happy to sell Millionaire’s Shortbread at 515 calories a pop, but I can’t have this drink in large (aka Massimo in case you were wondering). The drink according to the calories list had just 65 calories, so I am a little confused. If anyone can shed any light on the limitation to small drinks only please leave a comment below. Apparently I can order 20 small Bonfire Spice Lattes (for the office), but not one single large drink. Anyway I am definitely digressing from the flavour, which is more to the point for this blog. The flavour of the drink actually worked really well. It was topped with some sprinkles with there predominant flavour being burnt sugar, but the spices in the drink itself were lovely. There was plenty of cinnamon (and I love cinnamon) as well as lots of other warming spices, my guess is Allspice. There was a subtle hint of smokiness and and some sweetness from honey and cinder toffee. The drink wasn’t too sweet though, just nicely spiced and pleasingly warming on a cold blustery day. I haven't tried it, but you mentioned a predominant burnt sugar taste. Just a guess but if the drink is loaded with sugar, maybe the small size is something to do with avoiding the new sugar tax? Could be, I hadn't thought how the sugar tax affects hot drinks. Its 65 calories per 100g but 140cals for the drink if you order semi skimmed, 138cals for skimmed, and a whopping 206cals for whole milk! Also seems to vary whether you have drink in or takeaway. That would definitely explain it I think, quite a high cal drink even in the Primo size. Oh wow, I hadn't realised that, it is very high in calories and I think whole milk is their default choice.